This is the Siamese RG6 60% Shield Coaxial Cable your local Satellite TV company uses for Aerial Satellite Dish Feed Distribution. Our Customers use this in MHP Hotel Motel SMATV Cable TV, Video Surveillance and Hi Speed Internet Systems. 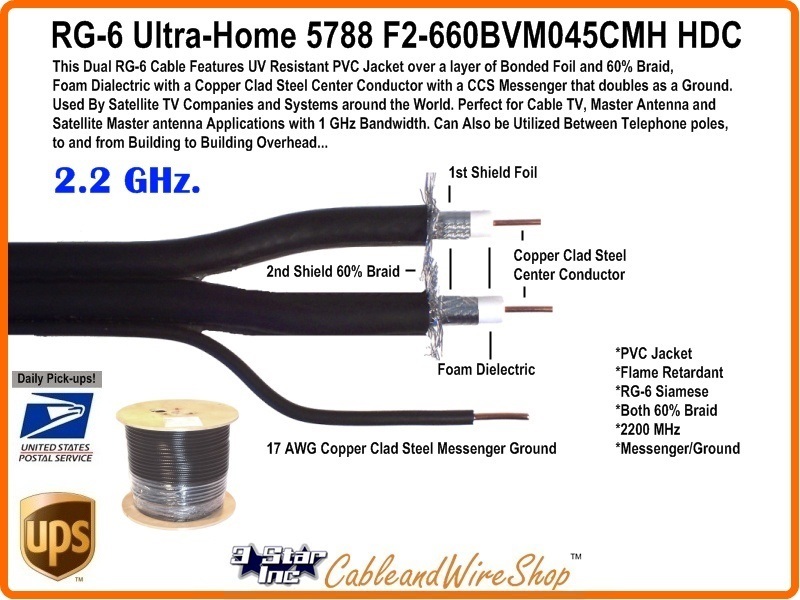 Good for 2.2 GHz, it features CCS Center Conductor, Dialectric Foam, Bonded Laminated Aluminum Tape Inner Shield, 60% Braided Outer Shield, 17 AWG Copper Clad Steel Ground / Messenger, all encased in a PVC Jacket. Note: This is the same Commercial Grade Dual Feed with Integral Ground Messenger Low Loss Cable your local Satellite TV company uses to get from the Dual LNB Satellite Dish to and through your House. Our Customers use this in their MHP Hotel Motel SMATV Cable TV, Video Surveillance and Hi Speed Internet Systems to distribute around Building Properties.